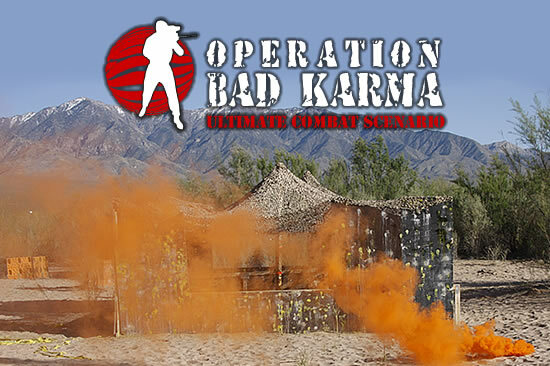 The third full scenario produced by the Bad Karma paintball team brought players from more than three states together to engage in a re-enactment of the Tom Clancy thriller, Clear and Present Danger. It was a game featuring innovative scoring and game elements, challenging objectives, great play and even better sportsmanship. Bad Karma used a unique scoring format with each side having different means of gaining points. The Special Operations team could score by taking and holding objectives, while the Cartel was able to score by delivering their packages to a single place from three bases where packages started. Both teams scored additional points for opponents elimination. Sniper missions rounded out major ways to score points. Only two matching penalties were assessed for the entire event. U.S. Special Operations were lead by Mike "Bad Finch" Rough of Rangerball Regiment while the Cartel was lead by Kunia "BOATA" Burnett of Skeleton Warriors. Teams attending included Rangerball Regiment, Skeleton Warriors and Desert Edge out of Utah, with Dead on Arrival, It Ain't Chemo, Demon Knights and Acid Reign from Nevada. Feel the Paint traveled from Colorado, and Dog Soldiers flew in from Indiana. Noteworthy was the command of both generals in this event. Mike "Bad Finch" Rough made full use of his assets (helicopters, air strikes, scouts in the hills) to support his missions. Taking bases was really tough for the U.S. team, having to hold a base through a re-spawn and fight back superior numbers of Cartel forces closing in. Kunia "BOATA" Burnett ensured that the delivery of kilos was kept up even while working to defend his bases. Both generals showed tremendous skill in marshaling their forces and were playing at the top of their game, making it a huge challenge for both sides. Special notice should also be given to the two-girl hit squad of Sterling "Safire" Rough and Alyssa Souza on the U.S. side. During the second half, they were showing up more experienced players as the U.S. team assaulted the Quarry base. Additional awards went out to players for unique or stand out play. Bad Karma would like to recognize Sterling "Safire" Rough for thinking outside the box in climbing halfway up a cliffside to act as a sniper and intel resource, radioing in movements to her command staff. 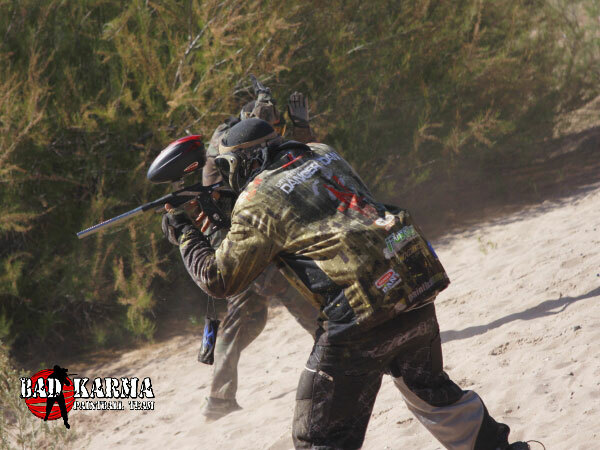 Also of note was new team in the southwest Paintball community, Dead on Arrival. This team made waves in their first scenario and first game for many of the players on the team. 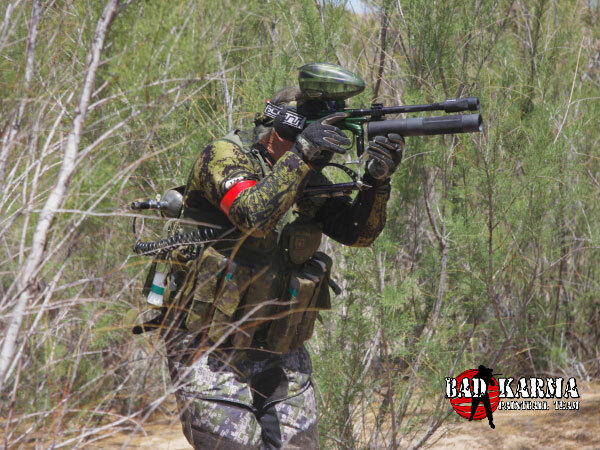 Bad Karma created a full display of Tippmann X7 Phenom markers, showcasing their versatility with many custom mods. Also on display were Medusa Paintball systems. 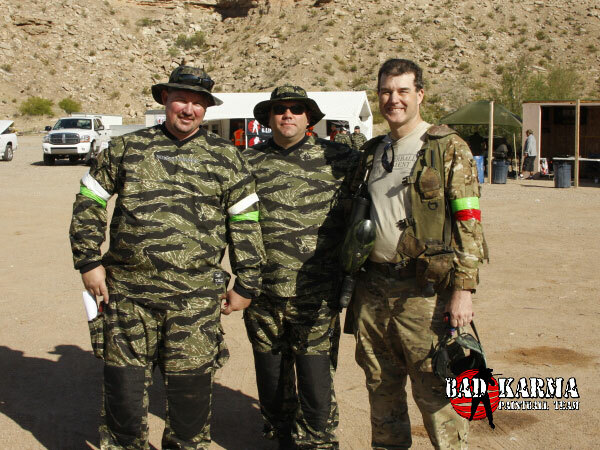 Bad Karma was outfitted in their new Valken V-TAC uniforms for the event. 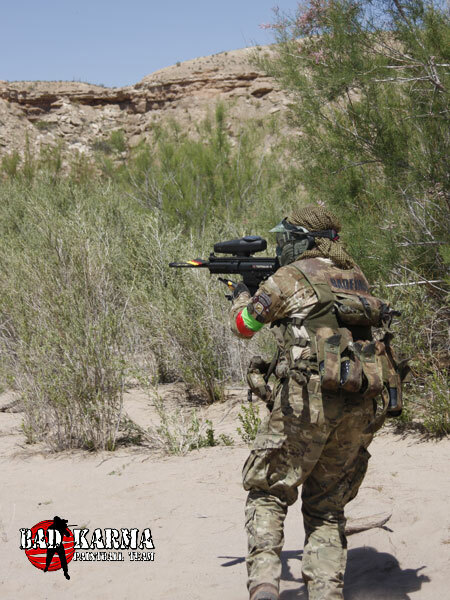 Some of the team's personal Tippmann X7 Phenoms were loaned out to players wanting to try the new marker, while two X7 Phenoms were given away as prizes. One of the winners was a very happy boy who will likely be a Tippmann fan for life! "Bad Karma put on yet another great event. The scenario was well planned and well laid out from the beginning. Objectives were very clear, and it kept the game play interesting throughout the entire scenario. BK was there in force doing an awesome job reffing the event. When I had one question over a player's status (I thought he was already eliminated when he called in an air strike). The ref went through the trouble of finding the status of the player out. Then, the guy was kind enough to come and find me during a break to tell me what exactly had happened. It was a legal play. What impressed me was the fact that the ref had the diligence to come find me out of the crowd to let me know what had happened. He didn't have to do that, but he was obviously trying to be honest. I'm sorry that I didn't catch his name, but what a great guy! I've never seen a ref go through all of that trouble. The game was very safe and very fun. BK had their own Tippmann X7 Phenoms there for player use! What teams forks over their personal markers for players to get a test run during a game? How cool is that? Thanks Bad Karma! It was an awesome event!" Bad Karma would like to thank the players who attended this event as well as event sponsors who made it possible.